In the exercise section of the Middle Age Spread Diet I have suggested "Let's just go for a walk" but for those of you who want a more structured schedule here is a Walking Programme to take you from being an Absolute Beginner to a Frequent Walker. Wait at least half an hour after eating before setting off. Wear comfortable, loose, light clothing. Don't overdress as this causes you to overheat. Wear socks and comfortable shoes that fit. 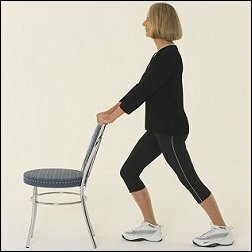 Perform your walking stretches (as below) before heading off. Drink water before, during and after your walk. Hold each stretch for 30 seconds on each leg. Also do stretches after you have finished walking. Ease into your walking, allowing approximately 2 minutes of warm-up time. Cool down by walking at an easier pace at the end rather than speeding up. Hold back of chair for support. Bend right knee so your right leg comes up behind you. Grasp right food with right hand. Hold at point of tension for 30 seconds and release. Repeat with left leg and hand. Stand on left leg and place right leg straight on seat of chair. Slightly bend left leg and holding back straight hold position for 30 seconds. Release and repeat with other leg. With knee bent, place right foot 30cm in front of left leg – keep left leg straight and foot flat on floor. Feel tension in calf of left leg. Hold 30 seconds and repeat with left leg. When walking check your pulse rate four times. 10 minutes later to check your pulse rate has returned to normal. To establish what your rate should be refer to the Age Related Heart Rate chart below. The higher age nearest to your age. Next follow across to the group showing number of heartbeats per 10 seconds for your age and use this as a guide to your walking intensity. Do this before leaving for your walk. To take your pulse, place two fingers on your wrist below the thumb bone with the palm of your hand facing towards you, OR place your finger over the artery in your neck, under your jaw in line with the corner of your right eye. Count the pulse for 10 seconds, then check that it is within your range. If it is too high, slow down. If it is too low, walk more briskly. 10-15 mins Once comfortable with this add more time – 5 min at a time then another day. 25-30 mins Build up time in 5 min stages: 35, 40, 45. Add another day. 30-35 mins Build time up to 40 min then 45 min. Maybe add another day. 40-45 mins Good level to maintain. If desired you could go to 50 min or add another day. When planning an exercise regime in conjunction with weight loss – TIME, DISTANCE and FREQUENCY are the most important factors. As a beginner frequency and time will have to be built up in stages. As they say "Rome wasn't built in a day". Set new goals each week. Once at a good level, maintain that level and maybe add variety to your walk by taking on some hills, exploring the beach or change your route for interest.